Mizuno's Youth Prospect Series GPP1155F1 Fastpitch Utility 11.5" Softball Glove features a polyurethane PowerLock strap secures the glove to your hand, plus ParaShock® palm pad and Butter Soft™ lining to reduce shock and minimize "sting". This glove is for left handed throwers. Glove fits on the right hand. Image is reversed. 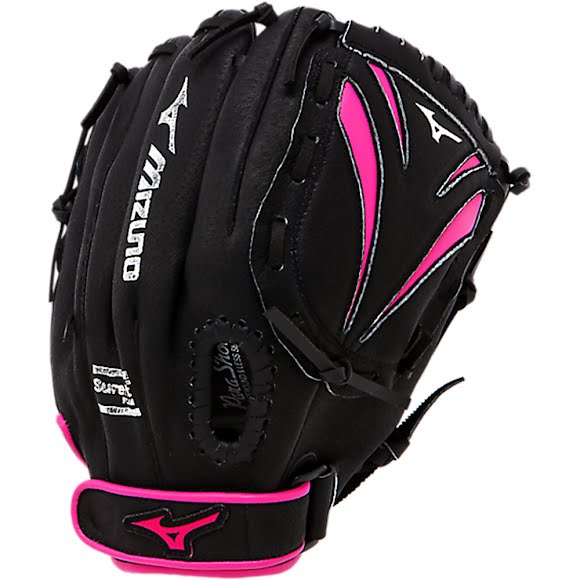 Mizuno&apos;s Youth Prospect Series GPP1155F1 Fastpitch Utility 11.5" Softball Glove features a polyurethane PowerLock strap secures the glove to your hand, plus ParaShock® palm pad and Butter Soft™ lining to reduce shock and minimize "sting". This glove is for left handed throwers. Glove fits on the right hand. Image is reversed. Patented PowerClose™ makes catching easy! ParaShock® palm pad and Butter Soft™ lining in select models reduce shock to minimize "sting"